Pollutants such as heavy metals, volatile organic compounds and dissolved solids are found in wastewaters. Heavy metal remediation of aqueous streams is of special concern due to recalcitrant and persistency of heavy metals in environment (Sud et al. 2008). They are removed on adsorbents such as activated carbon, clay and sediments in riverbeds and in suspension. Over the years, the role of adsorption in water/waste-water treatment has been critically investigated (Oke et al. 2008). Adsorption of heavy metals onto suspended particles had been studied as a model of transportation of metals in rivers and sea. The effects of chemical composition and particle size on adsorption by suspended particles had also been studied. Attention had mostly been on carbon as adsorption materials and indeed Erhan et al. (2004) had documented about 37 sources of carbon, which had been studied as adsorbents for the removal of water pollutants. 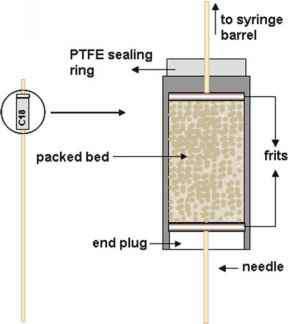 Three problems associated with the use of carbon for the adsorption of pollutants in a regular volume of waters are: (1) its relatively high cost in making renovation of water by this means very expensive, (2) the fragility of present types of activated carbon makes the regeneration and reuse of activated carbon difficult, (3) activated carbon is virtually limited to the removal of non-polar materials (Schroeder 1977) . Hence, conventional treatment technologies for the removal of these toxic heavy metals are not economical and further generate huge quantity of toxic chemical sludge, and research efforts have made that biosorption is now emerging as a potential and powerful alternative to the existing conventional technologies for the removal and/or recovery of metal ions from aqueous solutions. Biosorption is the binding and concentration of adsorbate(s) from aqueous solutions (even very dilute ones) by certain types of inactive, dead, microbial biomass. The major advantages of biosorption over conventional treatment methods include: low cost, high efficiency, minimization of chemical or biological sludge, regeneration of biosorbents and possibility of metal recovery (Sud et al. 2008). Another powerful technology is adsorption of heavy metals by activated carbon for treating domestic and industrial wastewater. However the high cost of activated carbon and its loss during the regeneration restricts its application. Since the 1990s the adsorption of heavy metals ions by low cost renewable organic materials has gained momentum. Recently attention has been diverted towards the biomaterials which are byproducts or the wastes from large scale industrial operations and agricultural waste materials. 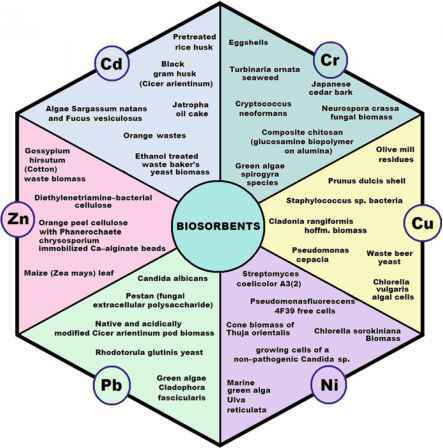 Hence, pioneering research on biosorption of heavy metals, intrinsically guided by the emerging concept of Green Chemistry, has led to the identification of a number of microbial biomass types that are extremely effective in concentrating metals. Green Chemistry (environmentally benign chemistry) is the utilization of set of principles that reduces or eliminates the use or generation of hazardous substances in the design, manufacture and application of chemical products (Kidwai and Mohan 2005). In practice, green chemistry is taken to cover a much broader range of issues than the definition suggests. As well as using and producing better chemicals with less waste, green chemistry also involves reducing other associated environmental impacts, including reduction in the amount of energy used in chemical processes (Kidwai and Mohan 2005) . Green Chemistry is not different from traditional chemistry in as much as it embraces the same creativity and innovation that has always been central to classical chemistry. However, there is a crucial difference in that historically synthetic chemists have not been seen to rank the environment very high in their priorities (Kidwai and Mohan 2005). But with an increase in consciousness for environmental protection, environmental pollution prevention, safer industrial ecology and cleaner production technologies, throughout the world, there is a heightened interest and almost a grand challenge for chemists to develop new products, processes and services that achieve necessary social, economical and environmental objectives. Since the types of chemicals and the types of transformations are very much varied in the chemical industry and chemical research worlds, so are the green chemistry solutions that have been proposed. purposes (crab shells, seaweeds). Figure 10.1 presents some of the biosorbents that have been recently tested and analysed for their metal ions removal capacity. Research on biosorption is revealing that it is sometimes a complex phenomenon where the metallic species could be deposited in the solid biosorbent through various sorption processes, such as ion exchange, complexation, chelation, microprecipitation and oxidation/reduction. The sections to follow highlight the pollution and toxicity characteristics of some selected heavy metals (Cd, Cr, Cu, Ni, Pb and Zn) and summarize in a representative manner the various biosorbents that have been studied for their removal from synthetic and/or natural contaminated aqueous media.